It's a work in progress, but here's a shot of my Python / wxPython / Numpy "panadapter" display for the Electraft KX3. 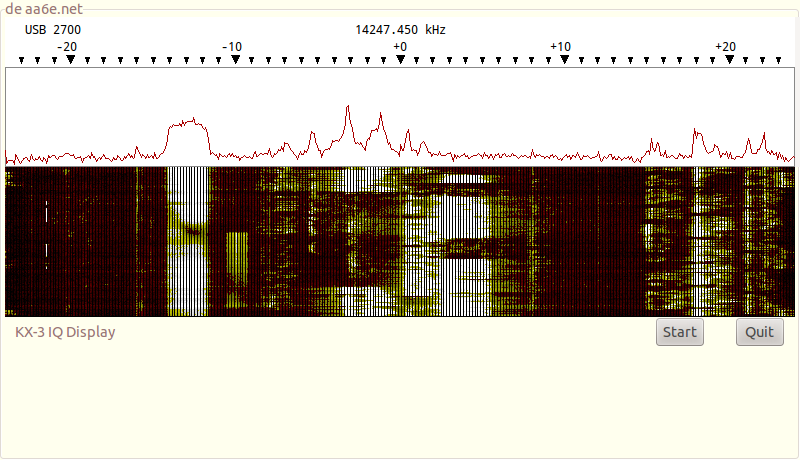 The KX3 provides a very nice IQ output (wideband, quadrature audio), covering +/- 24 kHz around the VFO tuning frequency. The total code size is about 590 lines at this point. This application (kx3iq.py) is really a remote control app. I "beam" the IQ data from the KX3 via my Beagleboard XM and a UDP Ethernet stream to the Python app across the room, with Hamlib rigctld provide rig control. Using 16 bit 48 kHz sampling, that's a data rate of ~200 kB/s without any compression -- doable over most ISP's these days, if you want a long distance remote.